Astronaut Space Toilet Instructions, Space Shuttle Atlantis Exhibit, Kennedy Space Center, Florida. 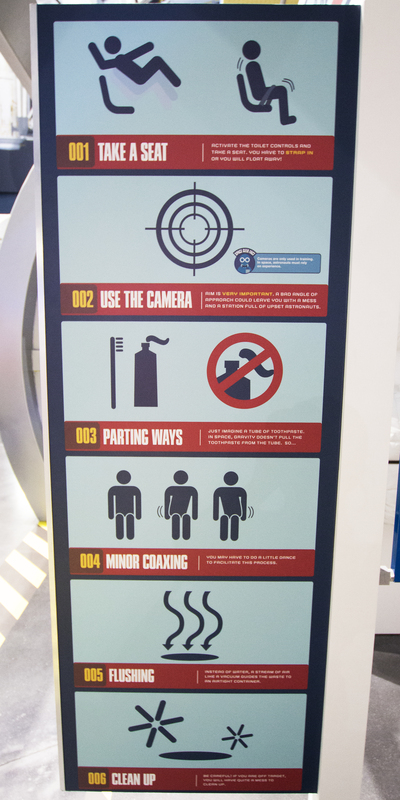 The sign details the following steps. (1) Take a Seat – Activate the toilet controls and take a seat. You have to strap in or you will float away! (2) Use the Camera – Aim is VERY IMPORTANT. A bad angle of approach could leave you with a mess and a station full of upset astronauts. (3) Parting Ways – Just imagine a tube of toothpaste. In space, gravity doesn’t pull the toothpaste away from the tube, so….. (4) Minor Coaxing – You may have to do a little dance to facilitate this process. (5) Flushing – Instead of water, a stream of air like a vacuum guides the waste to an airtight container. (6) Clean Up – Be careful! If you are off target, you will have quite a mess to clean up.